M. Night Shyamalan caps off his own cinematic universe with Glass, a strange sequel to both Split and Unbreakable that pits Bruce Willis’s sad, stoic, indestructible David Dunn against the 24 delightfully-energetic personalities of James McAvoy’s Kevin Wendell Crumb. Glass is meant to unify these two films and blend their sensibilities and thematic interests, but it hews closer to Split than Unbreakable. Like Split, it has a hermetic storyworld owing to its lower budget, which is worlds away from the seeming reality of Unbreakable. Furthermore, it has a more overt B-movie tone than Unbreakable. It’s the weakest entry in this retrofitted “Eastrail 177 Trilogy,” but by no means as disposable as the films Shyamalan was delivering during the mid-to-late 2000s. But your patience with Glass will largely depend on your tolerance for Shyamalan being up to his old tricks. Despite his deficiencies as a screenwriter, which I would identify as his mechanical plotting, clunky dialogue, and overreliance on twists, it’s easy to undervalue Shyamalan as a visual storyteller. The man has a brilliant eye for composition, as well as uncanny instincts when it comes to refusing a cut or taking advantage of cinema’s ability to create geographic spaces that don’t conform to reality. In Glass, he does something that is fascinating in our superhero-saturated pop culture, which is give us a whole new visual and thematic lens through which to frame a superhero showdown. The story arc for Glass is simple. A meddling psychiatrist played by Sarah Paulson imprisons David, Kevin, and Samuel L. Jackson’s criminal mastermind, Elijah Price, in a mental institution. As she probes their psyches and tries to prove they suffer from delusions of being superheroes, Elijah plans to break them out and pit David and Kevin against each other in a bid to prove superheroes’ existence to the world. Shyamalan uses these scenes to investigate the nature of superheroes, the character’s fractured psychologies, and our own expectations of how superheroes should look and act, which makes Glass a true metafictional superhero film, unlike the superficial meta style of something like Deadpool. The point about our expectations of what superheroes should look and act like is pivotal in Glass. Although David Dunn is seemingly indestructible, vulnerable only to water, and Kevin is able to turn himself into a hulking, cannibalistic monster known as The Beast, neither David nor Kevin look like the superheroes we’re familiar with from the movies that dominate our movie theatres. For instance, in the Marvel Cinematic Universe, superheroes display extraordinary, often magical, powers and have outsized personalities that are witty and full of good humour. Furthermore, much of the appeal of the MCU films is the convoluted plotting, eternal easter egging, and promise of some massive payoff down the line, which culminated in Avengers: Infinity War and the forthcoming Avengers: Endgame. If Marvel is the recognized standard, then the more complicated and drawn-out a superhero saga, the better. Shyamalan does not agree, which is why his characters are stripped-down archetypes of what heroes and villains should be. To him, and most importantly to the characters in Glass, the appeal of superhero sagas is the battle between good and evil, not the convoluted plotting or the fantastical powers. So of course Glass refuses the sort of large-scale spectacle, easy humour, perpetual escalation and endless climaxes of the MCU films. Instead, it offers more complex formal pleasures and surprising, but also bizarre, narrative turns that undercut so much of what we expect from superhero stories. For instance, in a conventional superhero film, much of the pleasure relies on watching superheroes unleash their powers on each other, but Shyamalan refuses easy payoff. An almost certain factor must be the film’s budgetary constraints (despite its marketing as a superhero film, Glass cost only $20 million, which is a drop in the bucket compared to all other superhero blockbusters). During a showdown with some police officers with riot gear, Shyamalan fixes the camera to the characters’ faces, giving us POV shots of a riot shield smashing into David or The Beast biting into a man’s neck. In other moments, when David and The Beast fight each other, Shyamalan cuts to inside a van as David pummels the outer walls, allowing us to watch as the metal caves in, but refusing us the simple pleasures of a straightforward conventional fight. If Shyamalan avoids simplistic action, he does give us a new perspective through which to view these sorts of characters and their actions (including fights), one that’s more grounded and personal than what we’re used to. The fight scenes are not the only formal tricks up Shyamalan’s sleeve. Once again working with Mike Gioulakis, who also shot It Follows, Shyamalan plays with on- and off-screen space, setting up dualities in his framing and constantly using colour-coded backgrounds and costuming to construct aesthetic palettes that convey the essences of characters and their archetypal boldness. For instance, Shyamalan colour codes the characters’ outfits, with David’s green rain poncho, Kevin’s yellow jumpsuit, and Elijah’s purple suit representing protection of life, evangelism, and royalty, respectively. Furthermore, Shyamalan plays with on-screen geographic space. In the hospital, he has David and Kevin in cells diagonally across from each other, so that whenever their cell doors are open, they can peer through the doorways at each other, building tension in the frame that parallels the narrative tension leading to the final showdown. Shyamalan also does something I’ve never seen in a film before, which is use deleted scenes from Unbreakable as flashbacks in Glass. It’s a simple yet brilliant formal device that links the films together while offering further insight on the characters. Of course, Shyamalan wouldn’t be Shyamalan if he doesn’t pull off a few narrative twists. In Glass, he unveils an entire conspiracy lurking beneath the surface of his trilogy, one that speaks to the audience’s desire for superhero narratives, as well as larger cultural attitudes towards what we want of heroes. It’s a big swing for the filmmaker, and I’m not entirely sure he connects with it. There’s something satisfying about the reveal of true motivations and all the interconnected plotting of these films, which links them all together in ways similar to the interconnected plotting of the MCU films, but there’s also something unclear about his messaging, or rather, mean-spirited, as if Shyamalan thinks we’re all fools for adoring superhero films in the ways that we do. You can also interpret some of the film’s commentary as another broadside at critics and cultural commentators, again showcasing Shyamalan’s unfortunate habit of lashing out at his detractors, even though he could simply ignore their arguments and keep innovating formally as he’s done before. The result is that Glass is a deeply fascinating and frustrating film. It’s a brilliant work of formal innovation in the superhero genre, but unsatisfying as the synthesis of Unbreakable and Split that was promised. It is bold and startling, but at this point, if you are not onboard with Shyamalan’s many idiosyncrasies, it’s unlikely Glass will convince you he has learned any lessons from his failures. Of course, the idea that a filmmaker should stop being who they are is a ridiculous notion. 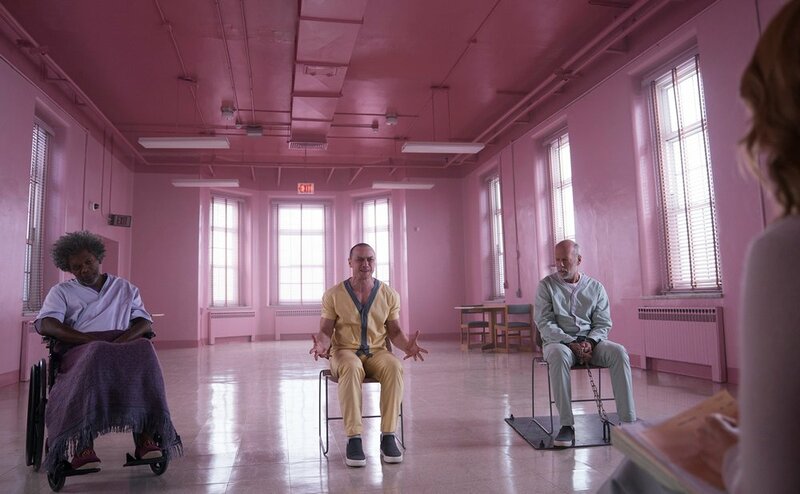 Audiences can take or leave what Shyamalan gives them, but at least with Glass, we know that he’s capable of giving us something new in a genre that has become repetitive. Written and directed by M. Night Shyamalan; starring James McAvoy, Bruce Willis, Samuel L. Jackson, Sarah Paulson, Anya Taylor-Joy, Spencer Treat Clark, Charlayne Woodard.